Having got to the end of the Gmeinder Gap saga I boldly stated that I would move on to a new project. However, when I reached into the New Project box it was empty, so I had to quickly think one up. 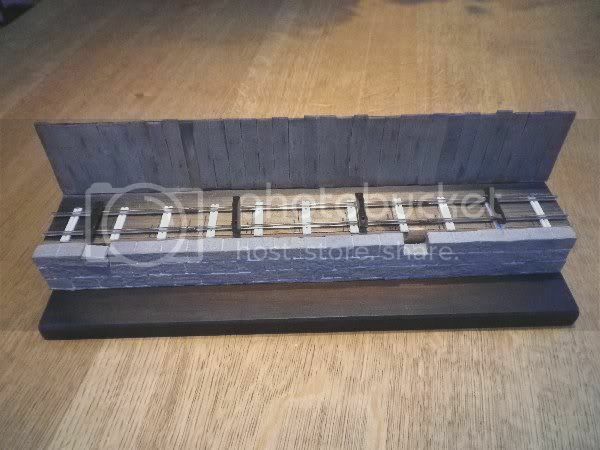 It's 13 inches long (because that's how long the piece of track I found in the back of the garage is) and will represent a piece of track on an embankment, with a fence or something behind. Some sort of neutral backdrop will go behind when required, and it can be stored easily when not in use. Last edited by Bilco on Thu Jan 13, 2011 2:58 pm, edited 1 time in total. It's looking good so far, and hate to be a party pooper ( ) but won't most of your locos be too wide for the track and scrape their sides along that piece of wood at the back? 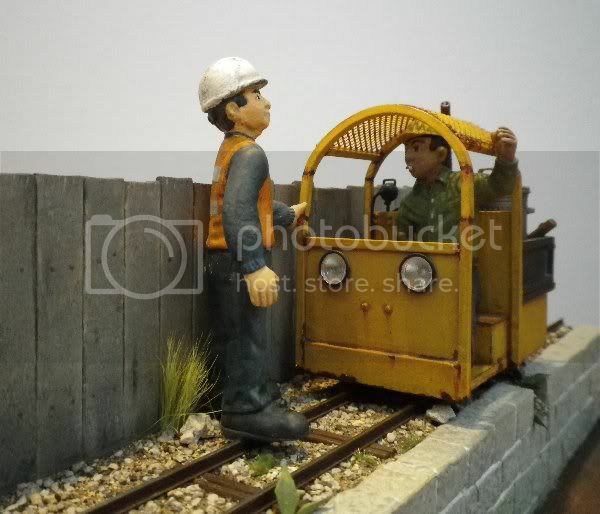 Hi Christian - yes, I had spotted that, and the track in the photo is placed purely for illustrative purposes I'm working on widening the trackbed slightly, but clearances will be tight, although this is not unprototypical. Of course very prototypical, but perhaps best to not be so prototypical that you actually scratch the paint off rather than just modelling the scratched paintwork!! That should really shape up into an attractive display. Even if you avoid scraping the backdrop, you will get ugly shadows on the backdrop when it is that close. A fence may work, but do not put any "sky" this close, much better to have a backdrop further back. If you want to get fancy with lighting, aim your strongest light on the backdrop (the sky is always brightest..) a second, weaker, light on your model from one side to give some definition to details, and a third light (wearker or farther away) from the other side to open up the shadows a bit..
Hi Lennart - many thanks for the tips on photographing my models on the base. I will certainly be putting the 'sky' background well back to avoid shadows, and the lighting will be mainly overhead, with diffuse lighting around the sides. It will be interesting experimenting with lighting and photographs when the base is finished. The fencing is recycled from the Drawing Board layout - it was on the left side before I ripped it out and put in the buildings. There were only just enough planks to cover the length - the little gap will be plugged by something in a while. The wall is covered in egg-box rectangles - I had a bit of an egg-box slicing frenzy when I was doing the walling on the Drawing Board, and I've got a box full of the things. I've widened the track base a little bit - mainly to compensate for the thickness of the fence - and with the walling I can put the track up to the edge - as per the photo. No danger of scratching the paintwork! Hi Bill, the fencing and wall give an interesting combination of textures. What ideas do you have for the lower surface? Some progress, despite a busy weekend. David - I was thinking of the lower surface being rough, stony and bushy, with straggly grass and maybe a few bits of junk artistically posed. I'll have to see what I have at the back of the garage. 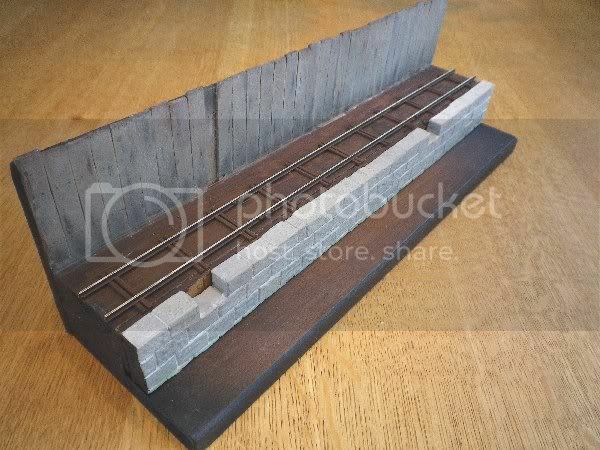 I grubbied-up the wall a bit, and dusted the fence with light grey powders to make it a bit more like weathered wood. I haven't textured the planks, but I've put in 'nails' with a fine felt-tip. Still haven't filled in the gap. 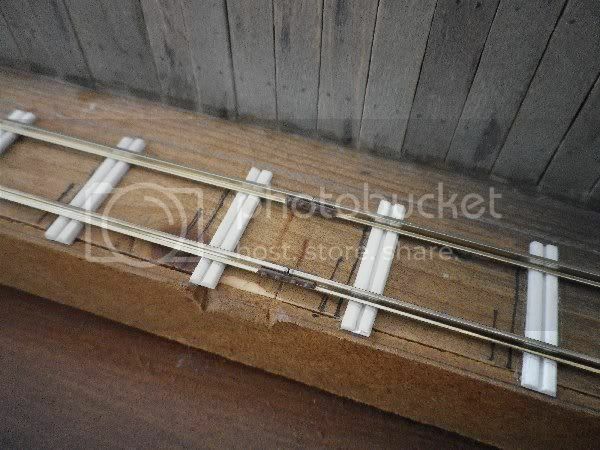 I thought I would have panels of Jubilee track, so I made some faux pressed-steel sleepers. As the ballast will be up level with the tops I've not modelled the full depth, as I did on the tipping dock of the Drawing Board. 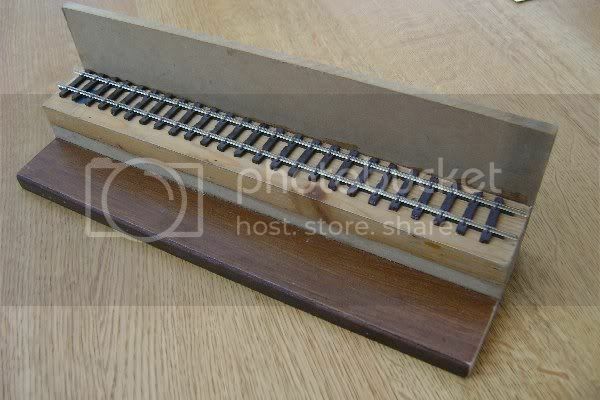 The intention is for them to look something like these on the Blenheim Palace Railway - I just fixed two parallel 2mm strips of plasticard to a thin base and rounded the edges. These are now glued down, awaiting the rails. I've cut the head of the rail to show the panel lengths, and fixed some fishplates under the cuts. Next step is to fix the rail down with CA, again as I did on the tipping dock. 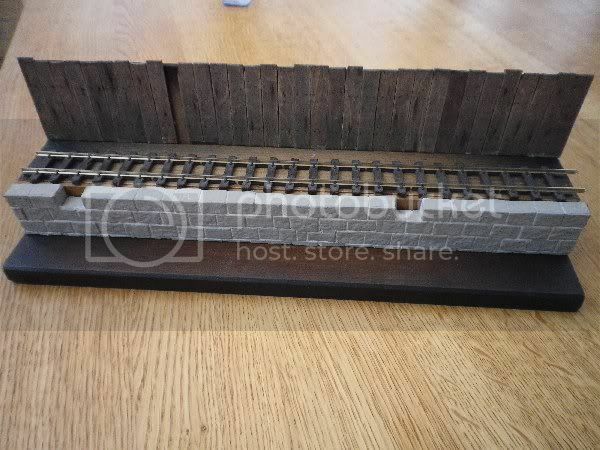 Once it's all secure I'll paint rails and sleepers, then fix the wall in place. 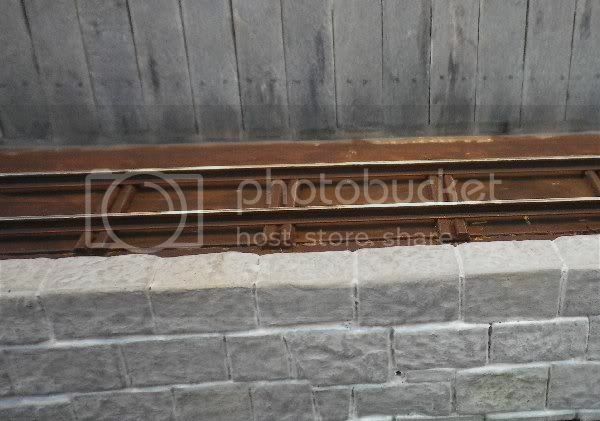 Nice, how about a close up of your faux pressed-steel sleepers. 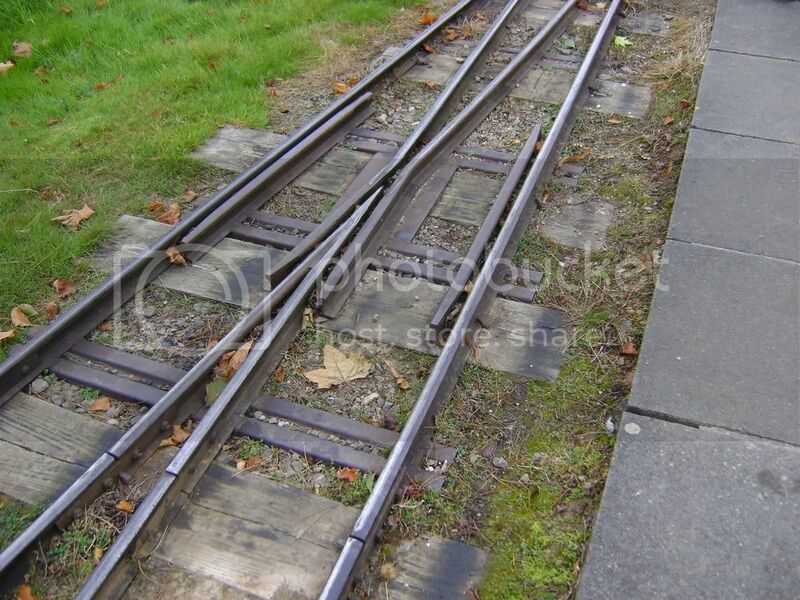 Looks like they didn't trust the Jubilee track. I assume the Jubilee would refer to Queen Victoria, and what did she know about trackmaking. The wood sleepers by themselves would support an Empire. Right - a couple of answers. Peter - I showed this point, and a couple of other photos from Blenheim, in Prototype Prattles http://forum.gn15.info/viewtopic.php?t=4596&highlight= You'll see there that John Garaty says the Jubilee sleepers were used to weld up the point at Keefe's works, and the wide wooden sleepers are to support the track on soft ground. 'Jubilee' was the Hudson trade name for this type of prefabricated track - there was an article about it in NG&IMR issue 10, with construction articles in issue 11 and 12. Hudsons took the idea from Decauville, and the date of Queen Victoria's Golden Jubilee - 1887 - is probably when the track was first marketed and the source of the name. Next job - paint rails and sleepers. Looking good, love the work on the detail of the track. Love your fishplates! 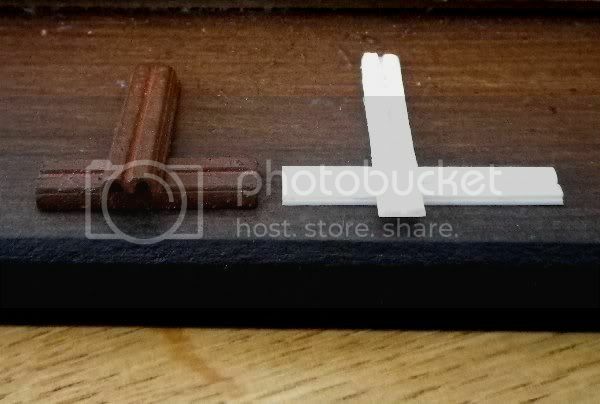 Are the nuts slices of hex styrene rod? I really should have put nuts on mine, but couldn't figure out how... The sleepers look good too, think we have some kicking around at the railway somewhere. Ah, yes. They are also on a point down at the bottom end! Hehehe! Ah - those fishplates. Well ... they are ready-made ones meant for O scale that I bought a while back from some model shop or other ... can't remember where. I also have some of the KB Scale ones meant for their O-14 trackwork, but they seem to be very brittle and half of them break in half when I'm trying to cut them off the sprue. KB Scale have a download about their Jubilee track construction which is quite interesting http://www.kbscale.com/pdf/Track&Turnouts-A5.pdf I also got some of their Jubilee sleepers, but they are too short and skinny for Gn15 (as well as the wrong gauge). I painted the track yesterday but haven't been around to photograph them today - I'll try tomorrow. Many thanks for the kind comments chaps. Martin - I'd be interested to know where you got yours. They are moulded in dark brown plastic and come in rectangular sprues of 8 pairs. There is a moulded peg on the rear, so they can go between two lengths of rail. ... and a cruel close-up. The edges of the sleepers catch the light a bit - I think I'll give them a light rub with the graphite stick to give them a subtle highlight. So that's it for the moment. 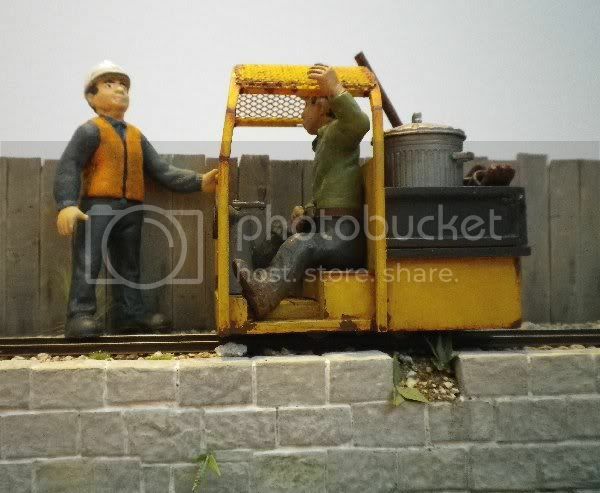 I'll get the wall stuck on and start to ballast - not nice, clean, regular-sized ballast, but the stuff I used for the slope on the Drawing Board, interspersed with weeds and bigger bits of stone. A little progress to report - my time has been a bit full for the last week, and I'm off on my hols soon, so not much will get done until I get back. Anyway, the ballasting has been done, and some vegetation has sprung up in the most unlikely places. Azzi in Welsh Ernie meets Den the Driver up on the embankment. The ferns growing out of the wall don't look too bad. Another view of Azzi and Den - "It's no good, you'll not get past, so back up." Smashing story telling pictures Bill. The little bits of plant and vegetation really bring the module to life. A nice showcase for your lovely critters.